This Simple Workout Will Burn Up to 285 Calories in 15 Minutes! In a study done by the American Council of Exercise, researchers found that kettlebell swings burn up to 20.2 calories per minute. Pretty impressive right? In comparison, a spin class was found to burn only 9.8 calories per minute. Now as much as I love kettlebell swings, the problem is not everyone has access to them. Some gyms don’t have them, and buying one yourself can be pretty expensive. You could use a dumbbell but it really isn’t the same. That said, what if I told you that there was an exercise that could help you burn 19 calories per minute using a piece of equipment that could be purchased for under 3$ (or less in some cases!). Can you guess what that exercise is? Believe it or not, it is jump roping! Yes, the simple exercise of jump rope can help burn up to 19 calories per minute. And do you know what can make jump rope even more effective? Adding in bodyweight exercises to the mix. Recently, I have been going through some crazy jump rope workouts that my good friend Shawna Kaminski sent over last week. It feels great to know that in a short 15 minute workout, I am burning up to 285 calories! Now I am not saying these workouts are easy (they certainly aren’t) but they are short, intense and get the job done. Just as workouts should be! 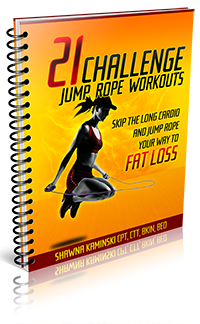 Now Shawna has been kind enough to put together 31 different jumprope/bodyweight hybrid workouts that were designed to obliterate unwanted fat (seriously). And the best part is that no matter what your fitness level, you can partake in these. Shawna is someone that I highly respect in the fitness industry and when it comes to fat burning workouts, she is one of the first people I turn to. If you are looking for a great way to change up your workouts, or even just a way to add in some fun workouts to your current workout routine, then head over and grab these 31 workouts while you can. To get 31 different workouts at 9$, this really is a steal. P.S. I have been doing jump rope workouts since I was 10-years old and are still something I find myself doing today. They are such a powerful exercise. I mean why do you think high level boxers are doing it all the time?